clearly separates kinematic (geometric) effects from speed or dynamic dependence. At thesuggestion of users, the authors have included no written computer programs, allowing professors and students to write their own and ensuring that the book does not become obsolete as computers and programming languages change. Part I introduces theory, nomenclature, notation, and methods of analysis. It describes all aspects of a mechanism (its nature, function, classification, and limitations) and covers kinematic analyses (position, velocity, and acceleration). Part II shows the engineering applications involved in the selection, specification, design, and sizing of mechanisms that accomplish specific motion objectives. 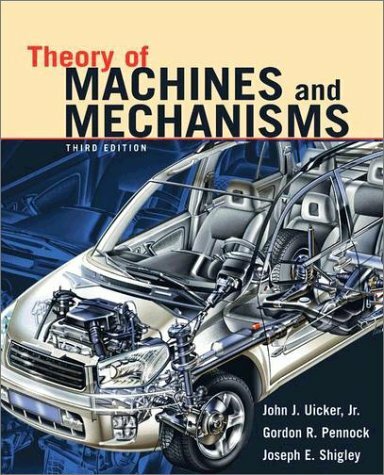 It includes chapters on cam systems, gears, gear trains, synthesis of linkages, spatialmechanisms, and robotics. Part III presents the dynamics of machines and the consequences of the proposed mechanism design specifications. New dynamic devices whose functions cannot be explained or understood without dynamic analysis are included. This third edition incorporates entirely new chapters on theanalysis and design of flywheels, governors, and gyroscopes.